Buen Camino! – This is the one sentence you will always remember. It is the meet and greet between pilgrims, and between pilgrims and locals. Bo Camiño / Bon Camiño – Once you are in Galicia you might hear this instead! as it is in Galician language. As you enter Galicia, you’ll see the Camino is referred to as: Camiño de Santiago. Ultreia! 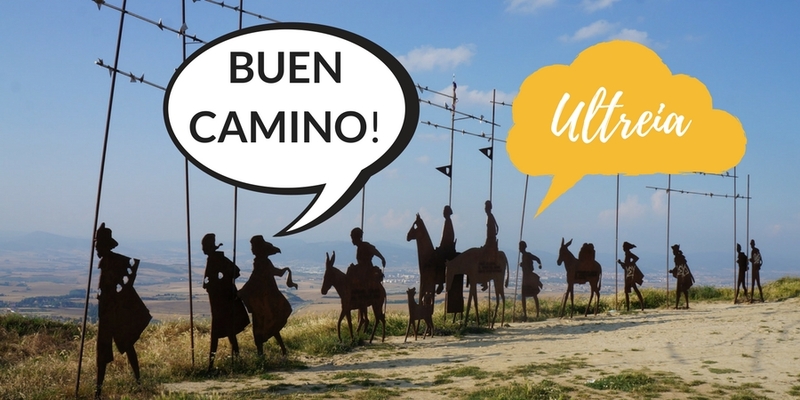 – It is a less known version of ‘Buen Camino!’ but the sentiment remains the same: safe journey to Santiago! Me gusta… el pulpo (Spanish): I like… octopus. Of course you can replace ‘octopus’ with any other food of your choice! calamares (squid), pollo (chicken), caldo gallego (galician stew), ensalada (salad), sopa (soup), pan (bread)… Gústame … o pulpo (also ‘polbo’) would be the lingo in Galician language. No me gusta… el pulpo: I don’t like… octopus. Non me gusta … o pulpo would be the same in Galician. Me encanta … el pulpo: I love… octopus. Encántame … o pulpo in Galician. Muchas gracias (Spanish) Moitas grazas (Galician): thank you very much! Bear in mind, depending on your chosen route you will encounter different languages: Galician in Galicia but also Basque (Euskera) along the Northern Camino, Catalan on the Camino Catalan, French on the French routes and Portuguese on the Portuguese and Portuguese Coastal Camino. That’s great, Barbara! We’ll be publishing a Portuguese for the Camino blog post soon, stay tuned! Let us know if you need an itinerary from the Customer Care team. Kindest regards. We hope to walk the Portuguese way in May 2016.